Our newly refurbished lounge area offers just the place to meet friends or colleagues. Practice your swing on our championship-standard 18-hole golf course. Our unique course provides a challenge for new golfers and seasoned professionals alike. Discover rolling parkland as well as a mixture of lakes and bunkers on our championship golf course. Seasonally inspired, locally sourced dishes are served daily in the Steam, Bake & Grill. Enjoy relaxed dining and drinking in a modern country setting. Relax with a drink or two in our newly refurbished bar. Impress your guests in our newly refurbished County Suite, with space for up to 250 delegates. Say your vows in our beautifully refurbished County Suite. Our County and Staverton suites offer impressive spaces for wedding breakfasts, each with their own bar and outdoor patio area. Fresh and neutral décor create a stylish backdrop to say I do. Our suites provide a blank canvas to tailor to your own special event. Comfort and luxury await in our superior bedrooms. 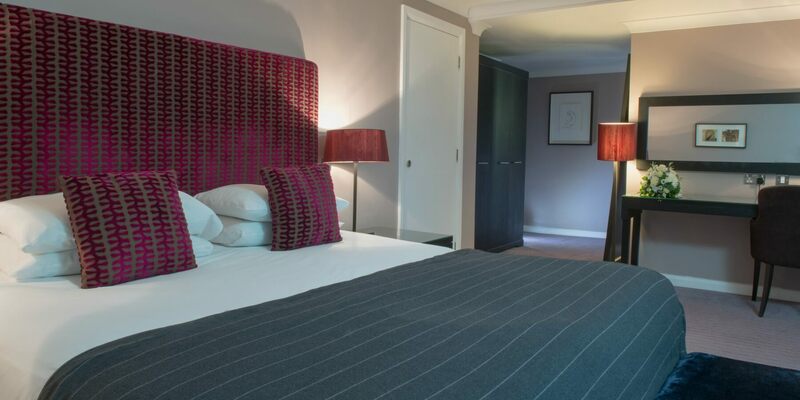 Unwind in our thoughtfully furnished bedrooms. Enjoy classic style and modern touches in our guest bedrooms. Take a dip in our heated swimming pool, complete with sauna and spa pool. Treat someone special this February with a luxury overnight stay including a three-course dinner, a bottle of prosecco, use of the leisure club and breakfast the next morning for two. *The offer is bookable until 28 February 2018 for stays from 1 - 28 February 2018. The rate quoted is a from rate per room per night based on two adults sharing a standard guest room. Dinner is a three-course dinner served in the hotel restaurant. There is no cash alternative. Offer is subject to promotional room & rate availability and date and room type restrictions may apply. Offer cannot be used in conjunction with any other offer, discount, group, or negotiated rates. Standard cancellation terms and conditions will apply as stated in the booking process.